Bristol, England is an old industrial city that's probably best known for giving the world trip-hop music. But it's also become a model for other cities in how to encourage people to play a direct role in fighting climate change. This story is part of CBC News special coverage of climate change issues in connection with the United Nations climate change conference (COP21) being held in Paris from Nov. 30 to Dec. 11. The mayor of Bristol, England is pretty frank about the pitfalls of trying to talk his people out of driving their cars to work. "I've learned a lot of new swear words in this job," says George Ferguson. COP21 climate talks: A new tone for Canada and Alberta? You can spot Ferguson from a distance. The former architect decided years ago to stand apart from a crowd of suits by always wearing red pants. He also ditched his car and travels everywhere by bicycle. Ferguson knows he's deeply unpopular with those madly attached to their fossil-fuel powered wheels. "I'm not anti-car. I think the car has a role to play. But I think it's a very stupid use of the car that we all drive in at the same time to get to work," he says. "I'm 68. I'm no young thing. So if an old git like me can cycle, so can most other people." Despite the detractors, Ferguson's lead-by-example approach, coupled with other carrot-and-stick measures undertaken by the city, appear to be resonating. More people are cycling. Carbon emissions are dropping. Although it is still the most congested city in the UK, Bristol was named Europe's Green Capital for 2015, based as much on its potential as its initiatives to become greener. Ferguson says only the rough-and-tumble but intimate world of city politics could deliver such results that quickly. The key, he says, is that municipalities are able to enact changes more quickly and directly than national governments. "The action is in the cities," he says. "We are closer to the issues, we're closer to the answers, and we're saying cities should be playing a part in this." That's why Ferguson, along with other mayors including Vancouver's Gregor Robertson, were invited to a discussion on the subject at the Vatican this summer. That's also why there was a summit-within-a-summit at the climate conference in Paris on Friday dedicated to the role of local governments. Ferguson was among the leaders of a figurative "march of the mayors" on a meeting that initially put national leaders front and centre. With the help of a city fund earmarked for local initiatives, Bristol has been encouraging its citizens to also play a direct part in finding ways to reduce emissions and fully earn the title their city was awarded. A city with old industrial roots, Bristol wants green solutions to grow from the ground up. In Millennium Square, the city's ambitions are summed up in the form of a windblown solar tree, a steel sapling with leaves made from damaged solar cells that can still harness the sun to make enough power to charge a mobile phone. 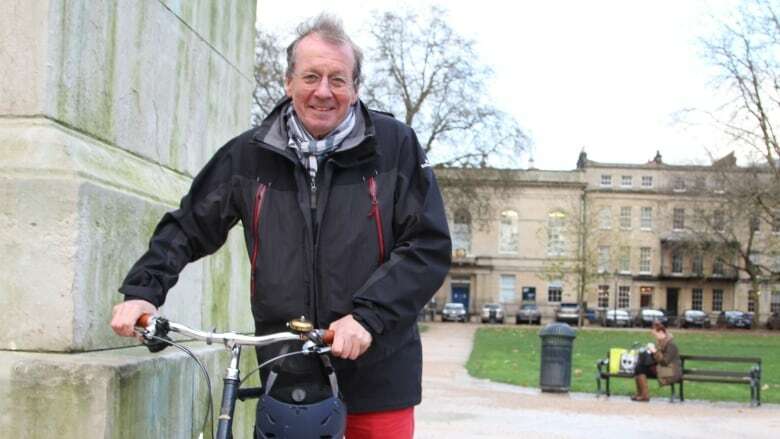 It's inspired by Bristol's industrial heritage, says John Packer, the artist who built it, and by a desire to get the conservation message across. "The idea is that passersby see it and they get it instantly," says Parker. So has a seed been planted? Is the conservation message actually getting through in Bristol? "There's lots going on around insulating homes, around being more energy efficient as a home," says Packer. "But as long as we still see 4 x 4s being driven five miles to work everyday by able-bodied people, then you know the message hasn't really gotten through." Enter what they like to call around here the "poo bus." There's nothing subtle about the source of the fuel. It's painted right there on the vehicle: a series of people sitting on toilets. Powering this prototype is the by-product of what a million people flush down the toilet. When treated, the raw material is turned into a useful fertilizer, coolant and enough bio-methane to power many buses. The bus company wants 110 of them in operation as soon as possible. "Our objective was to make a difference to the way we looked at waste," says Mohammed Saddiq, general manager of GENeco, which runs Bristol's main waste management facility and produces the biomethane. "And when you compare the environmental credentials of a biomethane-powered bus to diesel-powered buses, the statistics are quite incredible… it's not only significantly improving the environment, it's also being derived from a non-fossil fuel, which makes it very sustainable." Bristol has a well-established experimental bent — it is, after all, the birthplace of cutting-edge trip-hop music phenomena like Massive Attack and Tricky. That same attitude seems to inform the grassroots efforts at finding sustainable solutions that can be used locally by ordinary people. Alice-Marie Archer's Fish Project is a perfect example of this. She's been awarded funding to allow her to build a warehouse-sized version of the experimental mini-farm she's set up at a local café. The farm will produce both fish and vegetables that will grow on the fish waste. "There's something different when people take ownership of their places and their environments," she says. That is the view of the many mayors now clamouring for a deal at COP21. Bristol's mayor says it is a make-or-break opportunity for a historic, planet-saving deal. "I think it's going to be a real test of the resolve of nations," Ferguson says. "If we don't do it, I think we'll have been judged really badly by the future. I don't want to be part of that failure. I'm absolutely determined that the cities keep the pressure up on the national delegations to come to a good agreement."